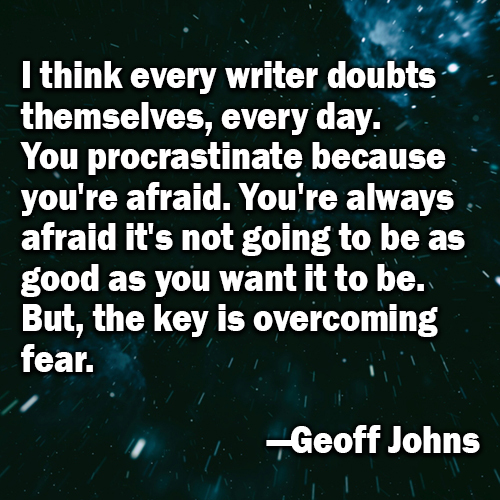 Choosing to be a creative writer means routinely subjecting yourself to fear. But most of the time, the frightening possibilities we imagine are much scarier than the actual worst-case scenarios. 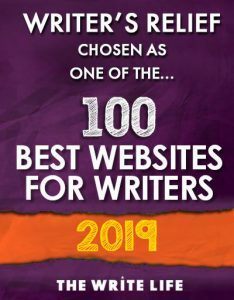 The experts here at Writer’s Relief let you in on the common fears creative writers face and offer practical solutions to ensure fear never holds you back—whether you’re submitting to literary journals, trying to get your novel traditionally published, or choosing to chart your own course and self-publish. 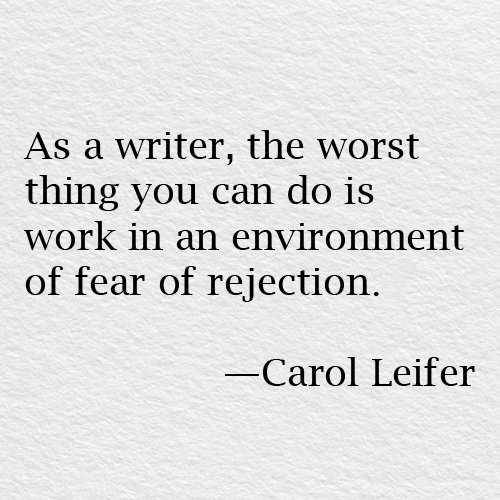 Fear of rejection letters. Some writers fall prey to self-sabotaging habits; their fear of rejection letters becomes so great that it stops them from making submissions to literary agents and editors. Fear of not making enough book sales to cover your investment. For self-publishing authors, shelling out the money for cover art, proofreading, formatting, and printing takes a leap of faith. The more money you have invested in your self-publishing career, the more afraid you may be that it won’t pan out. Fear of forgetting a great idea. Writers often lose their best ideas simply because they have not harnessed the best methods to keep track of them. Fear of not having an audience. Writers who publish are writers who anticipate having an audience. The fear that an audience will not show up can keep us from putting ourselves out there. Sometimes, it feels safer to stay home than to give a reading and face row upon row of empty chairs. Fear of not being taken seriously as a writer. No matter where you are in your writing career, you can still be afraid of not being given serious respect. Unpublished writers worry that they will never get published. Self-published writers worry that not partnering with a publishing house means people will assume their writing isn’t strong. Traditionally published writers worry that they will be written off as a “wannabe” who is never going to make it. The desire to be appreciated and respected can permeate all aspects of a writer’s career. Fear of being left behind or overlooked. Many writers worry that someone will steal their idea and publish it before they get around to doing it. Others worry that their peers are being applauded unfairly for work that is subpar—while good books and manuscripts go unnoticed. Fear of getting ripped off. Unscrupulous publishers and literary agents do exist, and they do take advantage of writers. Some companies disappear without a trace. Others make big promises that they can’t keep. Others entangle creative writers in damaging contracts that can hobble publishing careers for many years. Fear of being taken advantage of is countered by knowledge of publishing industry best practices. Learn more: Writers Beware: Self-Publishing Nightmares To Avoid and 7 Dangers to Avoid In A Literary Agency Contract. Fear of publishing something inaccurate. Even with expert fact-checking, editing, and proofreading, mistakes do happen. And when they do, the buck stops with the author. Fear of offending people/being ostracized. Authors who write about controversial subject matter—as well as memoir writers who are baring their souls—often struggle with the fear that publishing their opinions and their life experiences will horrify family and friends. Learn more: What To Do When Your Family And Friends Aren’t Supportive Of Your Writing | Writer’s Relief. Fear of negative reviews, critiques, and opinions. Once writers send their manuscripts out into the world, they are subjected to other people’s opinions. And while many professional reviewers are respectful, there is no stopping Internet haters from publishing unkind opinions. Learn more about dealing with negative reviews. Fear of not dedicating enough focus to marketing and promotion. Many writers feel that the modern marketplace is not friendly toward them. With so much emphasis on social media promotion, some writers fear that they have already been left behind. Learn more: Social Networking For People Who Hate Social Networking. Fear of not having anything worthwhile to say. Some writers are concerned that it has all been said and done, so there is no need for their voice. Fear of living up to expectations. Writers who have created a brand name for themselves worry about how they will continue to satisfy the demands of their existing readers. If my fear came true, what is the absolute worst thing that could happen? If you believe you can cope with your worst-case scenario, then what really is there to be afraid of? On the other hand, if you know that you definitely could not cope with the worst possibilities, then you may want to revisit your publishing strategy. Do you have proof that your concerns are accurate? Or do you need more information? You believe your family is whispering about you behind closed doors. You suspect derision, mocking, and contempt. But do you have real proof that your suspicions are founded on fact? If not, give people the benefit of the doubt. Don’t assume you have a disapproving audience until you can see it for yourself. Are you generalizing your feelings? One bad review or offhanded negative remark can seem devastating. And it can be easy to fall into the trap of believing that one person’s opinion represents the feelings of an entire group. It may be human nature to generalize, but you don’t have to succumb to negativity. Remind yourself that the most respectful way to regard an audience is to allow each and every single person to make up his or her own mind. Some people will like your book, and some people won’t. But one never speaks for all. If a person has a negative opinion of you, how will that impact your day-to-day life? Worrying what other people think about you and your writing is only natural. But practically speaking, can another person’s opinion about your writing meaningfully change the way you live your life? Sometimes, a negative review can become a positive learning experience. But if the negative reviews have nothing constructive to offer, they’re not especially useful in your day-to-day life. They offer nothing actionable. When you know an opinion is useless to you, it’s easier to let it go. Are you living in the moment? Writers tend to be thinkers. We mull, we stew, we imagine. Thoughtfully considering a possible future scenario can be helpful if it yields practical strategies for coping. But chewing on the same worries again and again—without solutions—can be a big waste of creative resources. Consider investing in mindfulness education and practices. Although reading books about mindfulness or committing to a meditation routine might seem to take up valuable writing time, you’ll actually save time in the long run if you can learn to dedicate your thoughts to practical, useful, energizing, exciting questions and possibilities—while letting the rest go. 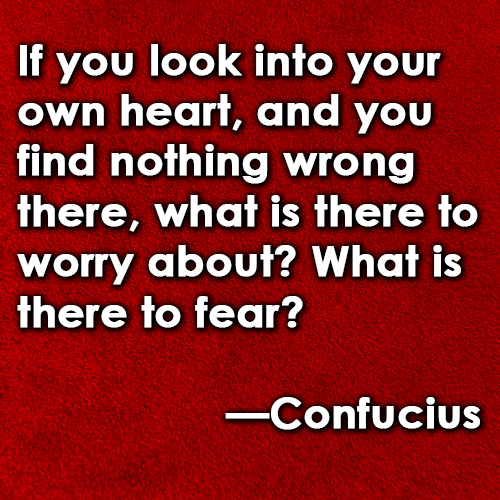 Find more questions to ask yourself that will help you deal with fear. No matter what your biggest fear as a writer may be, some other writer out there has already suffered through it and survived. 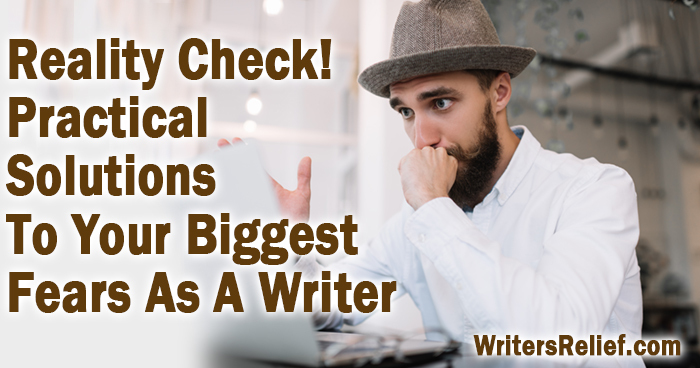 But if you are isolated in your writing life, you may begin to lose sight of just how common—and surmountable—your fears, disappointments, and challenges really are. Seek out other authors, listen to their stories about rejection and failure, and then reap the benefits. Not only will you learn practical lessons from hearing about others’ experiences, you’ll also feel a little less alone. Join a writing group. Here is a free list of writing groups and organizations. Take a class. Even if you’re not interested in a full-time MFA program, local colleges routinely offer continuing education classes for creative writers. Attend open mic nights. An Internet search for local poetry readings or creative writing meet-ups could help you connect with writers who share your dreams and challenges. Join a forum. Even if you can’t meet face-to-face with other writers, many writers groups (like those we linked to above) host vibrant online forums for writers to discuss their interests, air their grievances, and overcome their fears. Connect with a mentor. Sometimes it just takes one very special person to turn around your writing life and show you the path toward overcoming your fears. Learn more about how to find a creative writing mentor. Do Your Fears Really Matter? 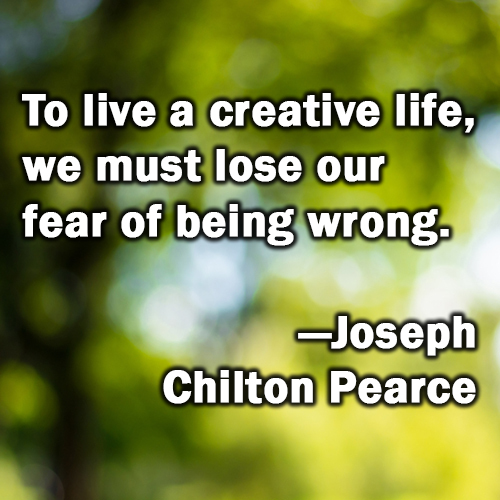 If you are struggling with fear as a creative writer, consider this: Does it matter? Your fears only become problematic when you allow them to encumber your goals. Fears will come and go. As the years go by, they will morph and change. The things you were desperately afraid of yesterday will strike you as cartoonish monsters today. And the things you fear today will become little more than harmless shadows tomorrow. You may not be able to make your fears go away. But you don’t have to let them hinder you. 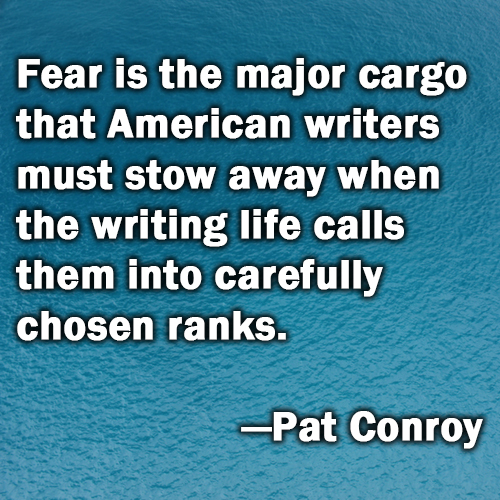 And in some cases, your fears can even drive you to become a better writer. 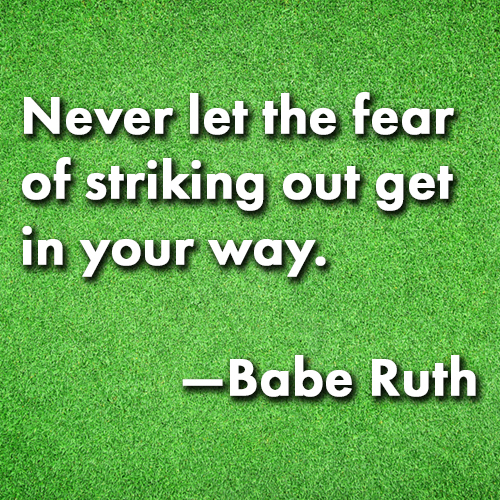 When you push through your fear, you win! Many writers struggle with making submissions to literary agents and editors. The fear of rejection letters can be paralyzing. Writer’s Relief has been helping creative writers make submissions since 1994. 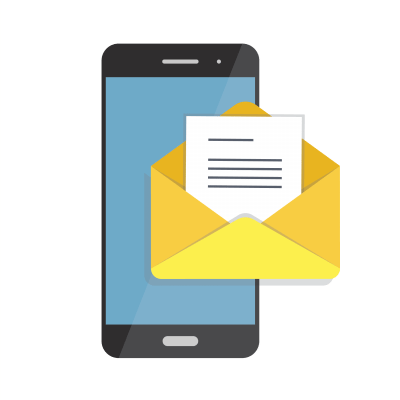 Although our expert assistance can improve a writer’s acceptance rate, we always warn our clients that rejection letters are a necessary part of a healthy submission strategy. With our encouragement, many clients report feeling less anxiety and fear about rejection letters than when they were making submissions on their own. It warms our hearts to think we played a small part in that positive shift in perspective! Even though I had published in magazines before, I dreaded opening my mail. Now rejection notes feel like a normal part of the process of finding the right venues for my work.—Writer’s Relief client Hilary S.
Learn more about Writer’s Relief’s submission assistance program. And if the idea of navigating the self-publishing process is striking fear into your heart, Self-Publishing Relief will help guide you through every step of the process so that your final result is a book you can be proud to put your name on. 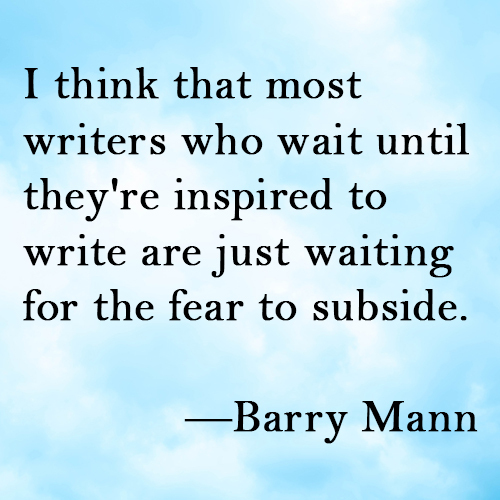 QUESTION FOR READERS: How do you overcome fear in your daily life as a writer? Please leave your valuable advice in our comments section for others to read! I overcome fear by listening to good music that can inspire me to write. 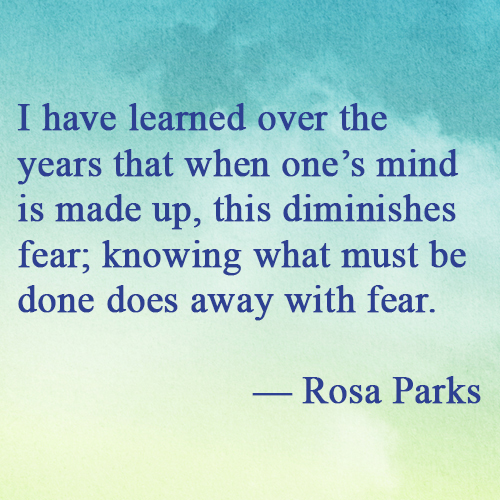 I also overcome fear by writing my fears down. The Quotes Part is very interesting.